Do you have West Australian ancestry? Directories are an immense source of historical information, both for the social historians and genealogists. They're essential for anyone searching their family history or building a family tree. Use them to find where a person lives and their occupation, not to mention about the times in which they lived. 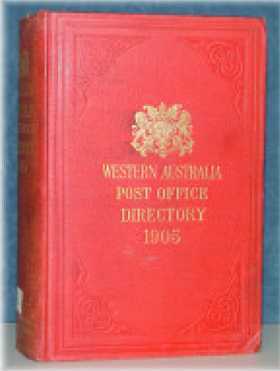 This Wise's Western Australian Post Office Directory is no different. Included here are two different sets, each containing a vast amount of information spanning 1905 to 1942. Find out who was the local manufacturers for cementware, or who were funeral directors, where the local hospitals were, who was the local night watchman. You will find doctors and judges, pig breeders and dairy merchants ... everything is covered! Divided into several sections, the Perth Street Directory lists each head of the household, house-by-house, street-by-street. There is a 'Suburbs' section which covered: Applecross, Bassendean, Canning Bridge, Gosnells, Karrakatta, Maddington, Nedlands, Oxborne Park, Queen's Park, Redcliffe, Scarborough, Victoria Park and Wattle Grove. These provide name, address and sometimes occupation. The 'Country Directory' is similar, and lists towns alphabetically, together with residents and their address and occupation. The 'Alphabetical Directory' lists everyone alphabetically by surname who lived in Perth and Suburbs, Fremantle, Boulder and Kalgoorlie. The 'Trades and Professional Directory' is effectively our yellow pages. Arranged by trade, each person is listed together with name and address. There are various other miscellaneous directories covering ecclesiastical, postal, government, societies and more. These directories are divided into three main sections: Towns, Alphabetical and Trades and Professions. These three classifications enable the enquirer to see at a glance the Householders or Traders in any one Town; the Business and Address of any resident in the State; and the Firms throughout Western Australia engaged in any trade or profession. The directory also includes many pages of advertisements, all of which provide useful information, often including names of people and places.